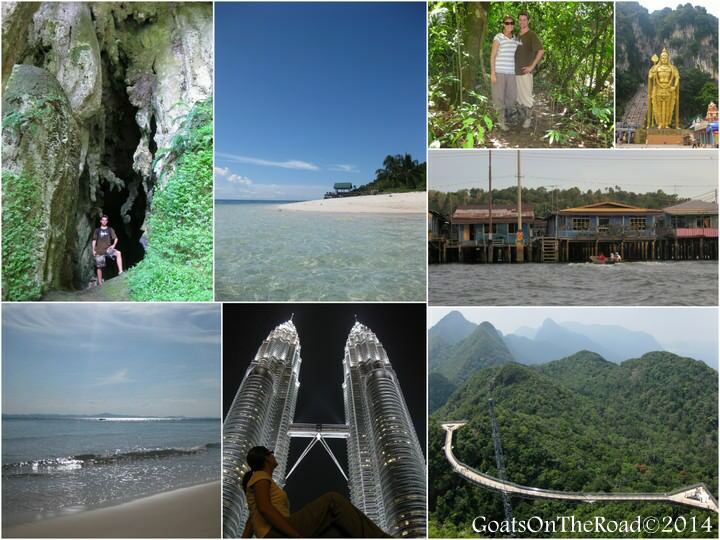 Goats on the Road Posts » Travel Blogs » Southern Asia » Brunei » Our First Backpacking Trip – Where It All Began! 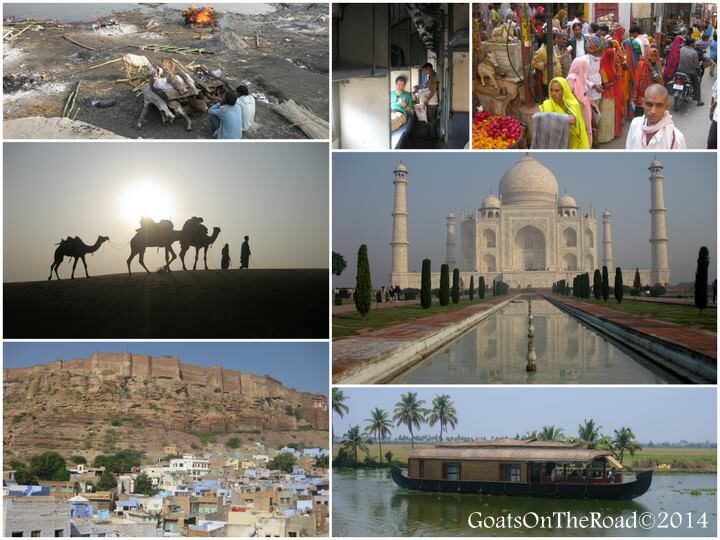 Our travel life began long before Goats On The Road was born, and because of that, we don’t really have any stories from our First Trip. We constantly refer to “our first trip” or “when we first started travelling” on this site, but where did we go? What did we do? When did we do it? How did we do it? Why did we decide to travel? Here we finally shed some light on our very first backpacking trip! Nick and I made the life choice to drop our perfectly normal, socially acceptable lives back in Canada and take off on a year-long trip. We both had good paying careers, a home to call our own, a nice vehicle, lots of friends and were always out socializing. We soon realized we weren’t happy with this lifestyle anymore and that something was missing. We decided we needed to make a drastic change and thought a long-term backpacking trip would do the trick. We had planned our route, booked our travel insurance, read more guidebooks than you can imagine, got our vaccinations, shopped for everything we needed and did all of the necessary steps for planning a trip around the world – which seemed very overwhelming at the time. In order to travel the world for a year, we needed to have some money. Nick worked overtime shifts, we saved money wherever possible, sold our home and our car and stored the remainder of our belongings before leaving. It was stressful, nerve-wracking and totally crazy…yet the moment the plane took off, we knew it was the right decision. After a few goodbye parties and farewells with family and friends, we left on November 18, 2008 and returned to Canada on December 22, 2009, just over 13 months later. I was 24 years old and Nick turned 24 the day our plane landed, not a bad way to celebrate a birthday! Not only is it a great part of the world for new backpackers to start out (the tourist trail is quite worn, it’s easy to get around, lots of other travellers, etc. ), but it’s a very budget friendly part of the world, and at the time, making our money last as long as possible was a top priority. We decided that our first stop should be the Land of Smiles, Thailand. There are so many amazing things to do in Thailand – especially for first time travellers. The feeling of landing in the crazy, chaotic, liberal, humid, loud capital city of Bangkok is indescribable. 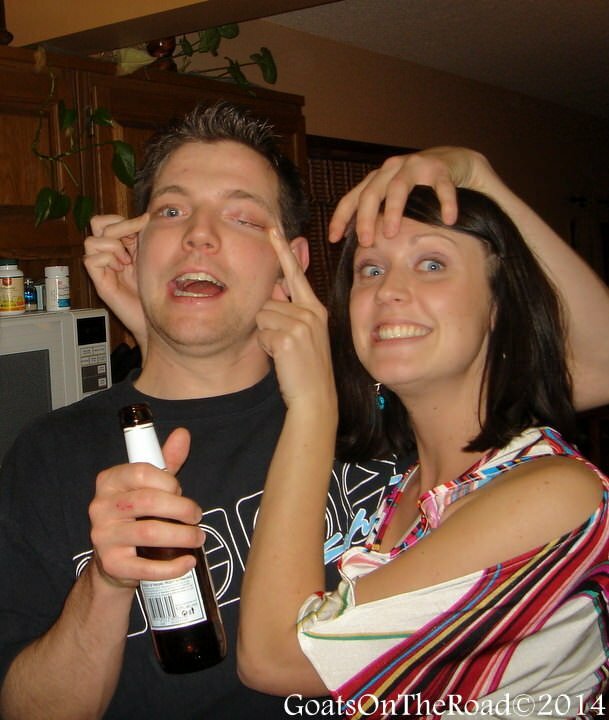 Our eyes were darting from side to side in order to take in all of the action. It was quite the culture shock… a very welcomed one. We were thrilled to be on the road and couldn’t believe we had over a year left ahead of us! We travelled by every means of transportation you can imagine and with inexpensive airlines in Asia, we were able to save some time by taking the occasional flight. Thailand: Nick getting his scuba diving certification, getting tattoos in Koh Tao, seeing elephants, sleeping in our first beach hut (!! ), eating street food, watching a muay thai boxing match, renting a motorbike, visiting the floating market and the crazy Chatuchak weekend market, finding deserted waterfalls, partying on Koh San Road (one of the best things to do in Bangkok! ), eating scorpions and maggots, and seeing some amazing beaches. Thailand was the first country we went to on our trip, which is probably why it holds a special place in our hearts. (all photo captions are clockwise, starting at the top left). 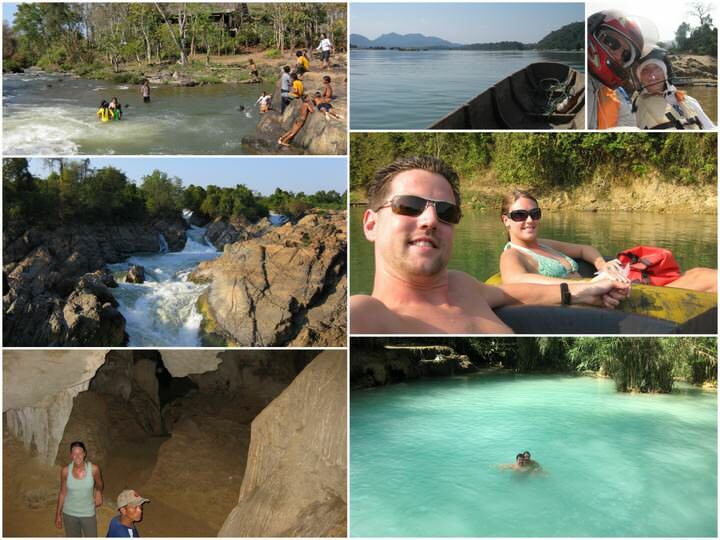 SEE ALSO: Things To Do in Chiang Mai and Things To Do in Pai. 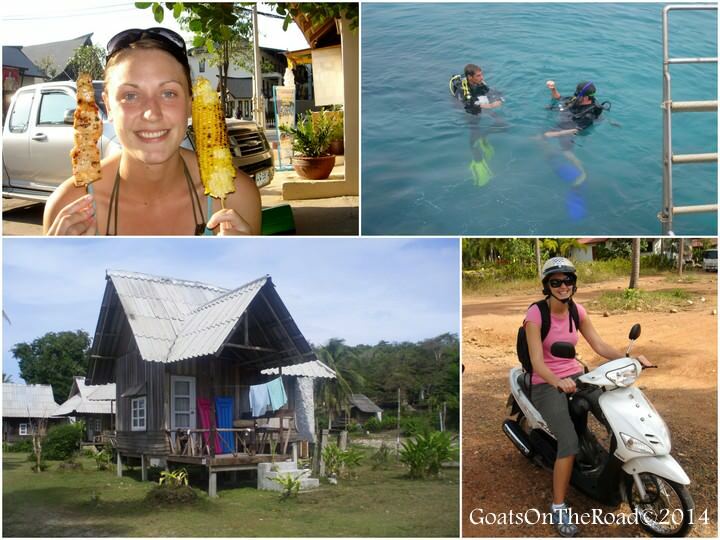 Thailand: streetfood, getting scuba certified, renting motorbikes and our first beach hut! Cambodia: Searching for someone to take us to Koh Rong Island – a deserted island with nothing more than a village and the nicest beach in the world. Partying on Pub Street, having a very inappropriate massage, the crazy Russian Market, temples & palaces, visiting the stunning Angkor Wat Temples and learning about the brutal history of the Pol Pot Regime by visiting the Killing Fields and the Tuol Sleng Museum. Vietnam: Me surviving a deadly virus (most likely dengue fever or malaria), renting a motorbike and exploring sights independently, partying with locals in Ho Chi Minh City when Vietnam beat Thailand in an important football (soccer) match, exploring the Mekong River Delta, squeezing into the famous Chu Chi Tunnels, spending our first Christmas abroad together, meeting locals (but not speaking the same language), finding deserted beaches and making our way south to the lesser-visited island of Phu Quoc. Laos: Cycling through deserted fields, going caving, tubing down the river alongside water buffalo, riding our motorbike through the Boulevan Plateau and discovering waterfalls, spotting the rare Irrawaddy River Dolphin from a dug-out canoe, the gorgeous Kuang Si Waterfalls, night markets, friendly, smiling locals and surviving the speed boat ride from Laos to Thailand. India: This country in itself is a highlight. However, I’ll try to name a few extras! 4 day camel safari in the Thar Desert, overnight train rides, meeting local people and sharing food together, people watching in Kolkatta (and everywhere), the smells – both good and bad, the scrumptious food, seeing our first Wonder of The World – The Taj Mahal, witnessing bodies be cremated on the banks of the Ganges River, exploring ancient forts, visiting bustling markets, houseboating for 3 nights in the Keralan Backwaters, celebrating Nick’s 25th birthday…and so much more. Malaysia/Borneo/Brunei: Gazing at the towering Petronas Towers, visiting the Batu Caves, taking a gondola up to 708m to a floating skybridge(! ), scuba diving at the pristine Sipadan Island, me attempting to scuba dive for the first time, renting a car to independently visit caves and national parks, sleeping in the jungle, going on a river safari to spot wild orangutan, enjoying the off-the-beaten-path island of Kapas, visiting a stilted home community, seeing the Sultan of Brunei’s museum of gifts and celebrating my 25th birthday! 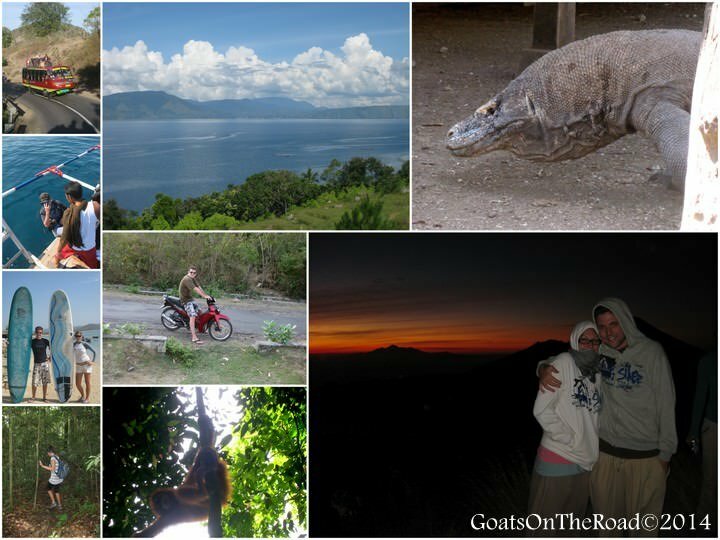 Indonesia: Renting a car and exploring Bali, trying surfing for the first time, seeing the prehistoric Komodo Dragons, scuba diving & snorkelling, doing an overnight jungle trek to see wild orangutans, staying at a guesthouse…on and island…on a lake…inside the caldera of a dormant volcano! Learning about Batak People, renting countless motorbikes for exploration, Nick surviving a deadly stomach virus, me losing my voice for almost 3 weeks straight, seeing a beached humpback whale, hiking up a volcano for sunrise, being spat on by an overweight Indonesian woman, riding on the roof of a bus, visiting untouristed islands and so much more! We were here for 2 months and could’ve spent 2 years. Singapore: An expensive, but fascinating city/country! We only stayed for 3 days but ended up being there for the Formula 1 Street Racing! Visiting Little India, Chinatown and Sentosa Island were also highlights of this tiny nation. 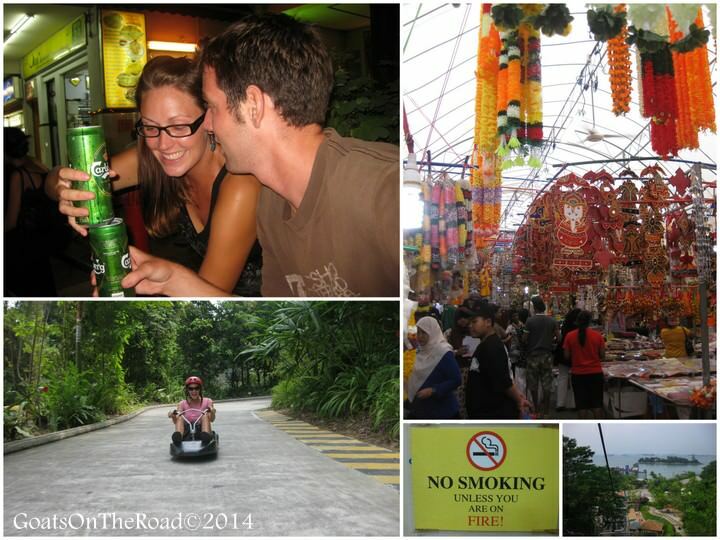 Singapore: partying during F-1 racing, Little India, Sentosa Island, funny sign, gravity assisted go-karts! Sri Lanka: Nick being sucked out to sea in a riptide and almost drowning, visiting the place where Buddha’s tooth is said to rest, train ride through lush vegetation, visiting cave monasteries, swimming and relaxing on stunning beaches, exploring waterfalls, meeting and dancing with local people, hiking through tea plantations and eating great food. After the end of our 13 months of backpacking around Southern Asia on a shoestring, we were both feeling very uncertain about going home. Would we fit in? Would we be able to handle being back in the western mind-set? After travelling in 3rd world countries for so long, going back to Canada felt very, very odd. As an example: we had a layover at the Seattle Airport and a group of women came over to sing Christmas carols to us – we both immediately looked away and said to each other “don’t look at them, or they’ll want money!” That was just the state of mind we had been in for 13 months. Even crossing the street at a designated cross walk and waiting for the light to change felt weird, so did wearing a seat belt. There are hardly any rules and regulations where we had been backpacking, so to come to Canada where there are many, was a complete shock. There was no street-food to be had, no tuk-tuks, no crazy chaos and nothing had changed – except us. We both found it very difficult and in my case, depressing, being back in Canada after this life-altering trip. We both knew that our lives were meant to be lead on the road. So, we worked hard for one final year in Canada and saved our money for a 16 month trip…and almost four years later, we’re still on the road and have found ways to turn our travels into our lifestyle! 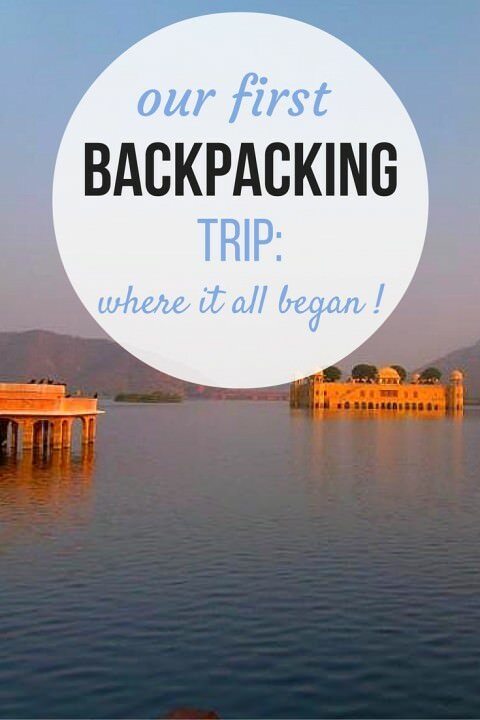 So, now you know all about our first Backpacking Trip – where our love for travel began! Does this sound like the kind of trip you would like to go on? Have you been on long-term backpacking trips and felt “reverse culture shock” when coming home? Share with us below! I am heading to Asia for the first time at the end of next year and I am so excited! I will only be travelling for about 7 months in total – going to Thailand, Vietnam, Phillippines, Hong Kong, India, Sri Lanka, Nepal and maybe Laos and Cambodia if time allows. I will definitely be using your guide to Indian trains when I am in India! “only” travelling for 7 months!? 7 months is a long time 🙂 Enjoy your trip, it sounds like you’ve picked some great countries to visit. Aw, how cool to read about how it all began. I can definitely relate to your experience. I just spent the last year traveling in SE Asia and South America. And for the last few months of my trip I was totally debating whether or not I would be able to go back home to California and reintroduce myself to “real life.” Traveling long-term is definitely life changing and going back home is a really, really weird experience. In the end I didn’t have to move back home. My boyfriend was offered a job in Indonesia. Now we’ll get the best of both worlds — making money while living in another country 🙂 Hooray! Yay! So glad to hear you didn’t have to go back to “reality”. That’s fantastic that you two can live abroad and make money. Going back to the western mentality can be soul crushing and I’m glad you’ve found ways around this. The counter culture shock when you arrive back in a Western nation is really surprisingly tough, actually!!! I’m going through it myself at the moment. Love this post – too many things to pick a highlight, but I loved reliving some of my experiences with this, and getting jealous of all the other ones I want to do!!! Aren’t memories great? The nice thing about a blog is that you’ll always have these memories documented, even when you’re 80 (providing you keep paying for your domain and hosting 😉 ). Pretty cool seeing you both so young. You must both look back and chuckle how far you’ve come in both travelling and blogging. Scary about almost being dragged out to sea in Sri Lanka! That’s part of the reason I really wanted to get this article written – during the floods in Alberta in 2013, Nick and I lost all that was left of our belongings….including my detailed journals from our 13 month trip 🙁 Soo upsetting. Anyways, I still had emails that I had sent family members so I was able to get some of the dates and routes right! Having a blog is a great way to document and keep track of memories. Thanks for the comment 🙂 Happy travels. So many thoughts on this! So funny that you were saying don’t look at them , they’ll want money! I had that mindset too when I went home. Also, lucky ducks seeing F1 in Singapore while being there such a short time. Lastly, I think you need to come back to India! OR have you since? haha, it’s sooo crazy how you think when going home after a trip (especially one in 3rd world countries) We hated going to the grocery store because we felt that everything was way overpriced, we both tried to bargain for things that you wouldn’t normally bargain for and we really, truly, honestly ignored the nice carolers at the airport! lol. Yes, we’ve been back to India. So, we went there two times in 2009 and then we went back again in 2012. Really want to come back again – there’s so much more we haven’t seen. I leave in 1 month for my first solo trip! I’m starting in Beijing, taking a year to slowly make my way down to Bali, then a year long WHV in Australia and finally another WHV in New Zealand! I’ve been planning and saving for two years and am so excited for the time to finally be here! that’s fantastic!! I love that you’re travelling so slow as well – you’ll be able to see and feel so much more that way 🙂 Enjoy Asia and your time in OZ and NZ, we’ve never been to those two countries, but they’re high on the list! Sounds like it was such an amazing trip! I definitely felt reverse culture shock after returning back to Canada and I had only spent two months in Southeast Asia, so I can only imagine how crazy it was for you guys after 13 months! I keep hearing great things about Sri Lanka and I’m definitely intrigued by it! Ya, it’s a weird feeling, isn’t it?! 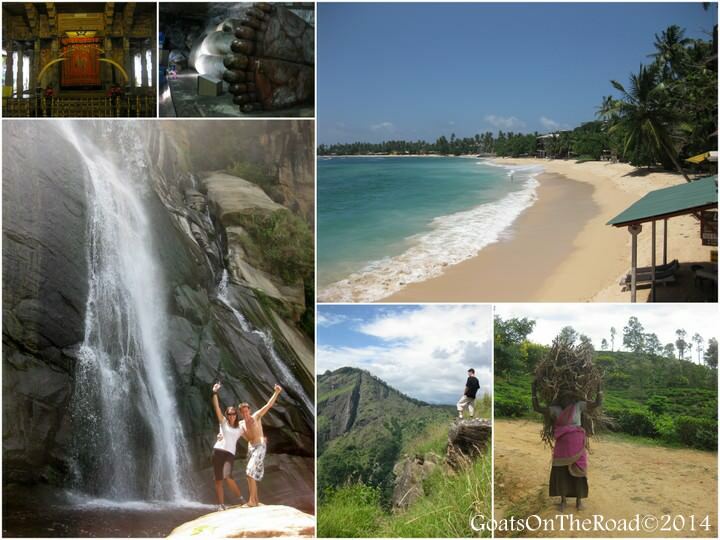 Sri Lanka is great – friendly people, great culture, amazing food and lots of sights all packed into one tiny country. I managed to get a six month leave from my American job between September 2009 and March 2010 and made a nearly identical tour of SE Asia and India. I visited Sumatra instead of Bali and didn’t have find the time to make it to Sir Lanka or Brunei. But yeah, nearly identical. I undertook my trip at the age of 34 not 24 and as such it was a bit more stressful as I had worked very hard for a decade already to establish myself in a semi-glamor career that requires heavy dues up front but a nice ride, a good paycheck and nice perks later. Coming back home to the States was awful and jarring. I was most struck by how unfriendly, fat, pale and miserable looking the people were I encountered on the airplane. Flying in Southeast Asia was always a joyous and festive occasion with almost everyone onboard being in high spirits. As a resident of New York city I could always seek out a decent facsimile of the SE Asian food I grown accustomed to on my trip and if not I could find the ingredients in an ethnic grocery and come pretty close to it myself, but the cold long winters and stressed, very serious NorthEastern city culture was hard to swallow. I turn 40 this year and recently began a new job with a different employer in the same field and could only manage to get a pathetic 12 days off to see all of Mongolia. Next year will be a much better year for me and please don’t feel sorry for me. I am a very lucky and unusual American. I live in sunny warm southern California now, I like my job and I usually manage to take two month-long trips every year and a few shorter ones, but I am jealous of your lifestyle. I congratulate you on your freedom. 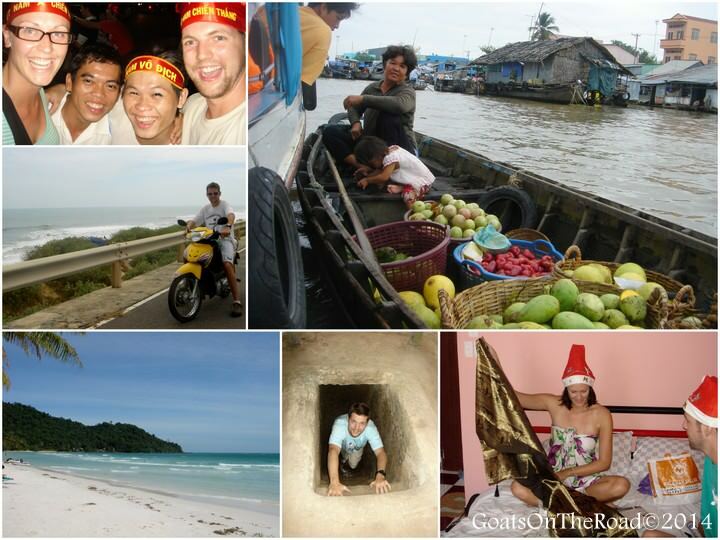 If I had embarked on my SE Asia trip at age 24 there is no way I would have came back either. The modern western life isn’t all its cracked up to be. It’s great that you got to take a 6 month trip, no matter your age. And it sounds like you do a lot of travelling throughout the year, that’s awesome! If you like your job and your lifestyle, then it’s all good. Wow I am truly inspired by your story. I’m completely consumed by wanderlust as well! I grew up in Ohio, lived in Australia for middle school, spent my sophomore year of high school as an exchange student in Italy and now I’m taking a gap year to travel the world before going off to college. I already went to Italy, now I’m in Denmark, next I will be traveling to Finland, Germany, Japan and Africa! I attached my newest blog post to this comment, please feel free to check it out!! 🙂 My boyfriend is taking a gap year as well in Germany this year and one day we hope to also turn travel into a permanent lifestyle! Thanks for the inspiration! Hi guys. I’m planning on going travelling, so that’s how I’ve found your blog. That and a LadBible publication… My initial plan was to cycle from England to China to meet some friends who have moved over there. But I have limited backpacking experience and I’m not convinced I have the knowhow to sort myself out in that area of the world if I needed it. The plan now is to cycle through America and hope to cycle from Miami to Seattle after a few further months of saving. From there I’ll try and get to Beijing and see how I feel about cycling home after a few months of back packing experience in a culturally easier setting. My question is actually a pretty odd one. How do you… do stuff? I wouldn’t want to spend my traveling days cycling 100 miles and sleeping. I’ll want it to be as much of a trip as I could. But how do you (know how to?) come across activities, or peoples whilst out travelling? Does it just happen? Wow, this comment is way, way overdue! I’m so sorry that it was missed and I hope you had an epic trip! that’s really soo cool..yeah we only live once so doing things unusal is very exciting ..there’s always a question that come to my mind ..why do i have to study and work in a company like the others..i must do something different..and you guys let me rethink again about this issue lol.. I am in my 60’s, retired with a pension, but have a chronic illness that requires me to “pace” myself. I always thought I would do a lot of traveling after I retired, but find myself limited by illness and a husband (older than me) who doesn’t want to retire. I hope your website will include information that I can use. Thanks for your email message. 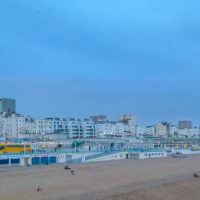 There are all types of travellers in the world, and travel can even include going to your nearby city for a weekend away 🙂 It doesn’t have to be a year long travel stint! I hope you and your husband are well and enjoying life! Yes!!! I love that! IT’s a no excuse zone for sure 🙂 Happy trails! I came across your blog looking for ideas on how to backpack through Mexico! I read your story and congratulations!! You are my kind of people. I have been traveling for 8 months now and I love it so much. I plan on continue with my travels for another year or so. Just wanted to say great job on the blogs and keep writting!!! 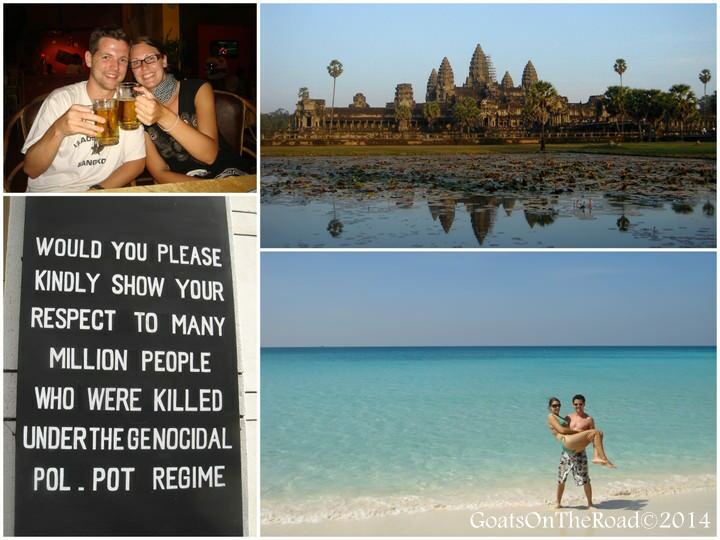 Do you have any idea the rough estimate of what this trip cost you? I found your site very late last night but kept reading till sunrise, what a beautiful story. Travel is the best education outside campus because it is real. After years on the roads, I am no longer watch T.V. or view the world in only one perspective. We need to experience, nothing better than the real thing. Unfortunately, millions of people are victims of their own society. They must get out and see just like you do. East and West is an opposite direction, so is the ways of living, but we are all one at lease inside our heart, love, and compassion. Travel and mingle with the local will bring us there.